By Peter Newman, Curtin University. Oh for the love of god, more anti-vehicle rhetoric from a known anti-vehicle activist. I hope the residents of Fitzroy, Abbotsford, Collingwood etc. continue to enjoy the pollution, noise and traffic being pumped out by the stop-start traffic day-in-day-out instead of putting it all cleanly and efficiently underground & out of the way and returning a much quieter peaceful neighborhood which could benefit from added bike lanes, expanded sidewalks and greenery and narrowed roads which all would result from this vital & necessary piece of infrastructure. You cannot move trucks, tradies, reps & people who need vehicular access from one side of town to the other to rail or public transport. You also don't neglect public transport either - build the Doncaster Rail in tandem but you do not just spout a bunch of anti-vehicle rhetoric to pretend a huge traffic problem that has existed for 30+ years and is only going to get worse will magically go away by building a rail line or simply doing nothing. PS. The Victorian people did not 'speak'. Polls showed 60%+ of Victorians thought the EWL was a necessary piece of infrastructure, but 60%+ of Victorians also don't live in that corridor and hence didn't consider it enough of an issue to vote for. The poor misled residents of the very inner city suburbs that voted in the Greens and along the eastern corridor are going suffer at least another 3-4 years of pain & fumes thanks to the political posturing of the Labor Party while the rest of Victoria could care less. The cars and trucks will only go underground for that short section, all the noise, pollution and traffic will just be transferred to connecting roads such as Hoddle St and Chandler Hwy in greater numbers. The EW link does not have a natural catchment for trucks like Citylink as there is no major industrial area in the eastern and north eastern suburbs. Tradies usually work locally and sales reps are very small in number. The political environment has changed and people want better public transport as it is the only solution for the travel needs of most residents (not only greenies but students, commuters, shoppers and leisure travellers) . Any political party that pushes roads over PT will not survive very long as they are ignoring what the majority of the people need and that is better PT infrastructure. I am not sure which service you are talking about but in regards to car sharing like goget, green car share and car next door this would greatly reduce private car use and traffic. These services greatly reduce car use because people would only use the car for the minority of their journeys and use PT, walking and cycling for the majority of their journeys. Llib there are far more trips being forced off onto 'connecting' roads such as Hoddle and Chandler Hwy at the moment with no link than there would be with an EW Link in place. I'm but one of many examples in how it would forever change my habits - no more need for 'rabbit runs' through the northern suburbs etc. By the way, you're assertion that there is no industry out East is incorrect - have you not been to Bayswater North, Kilsyth South, Knoxfield and Scoresby? It's pretty simple, one of the things we need to do is to make much better use of the road infrastructure we already have by LINKING them properly. We need to take pressure off the Monash and take zillions of trips away from the centre of Melbourne by Linking our EW and our NE and allowing all those trips to BYPASS the central part of Melbourne. This, along with Melbourne Rail, RRL, expanding Loop capacity etc. is all crucial for Melbourne's future livability and productivity. Llib there are far more trips being forced off onto 'connecting' roads such as Hoddle and Chandler Hwy at the moment with no link than there would be with an EW Link in place. the additional connectivity of the freeway would have attracted additional trips to roads with interchanges to the freeway... Hoddle Street might have been reduced in a southbound direction with less people using it to access the north/west of the city but instead mroe people from Richmond/Hawthorn/East Melbourne would have used Hoddle Street northbound to access the new tunnel for faster trips to the west and north. As I've said above the governmetn forecasts were for 30% additional trips on the eastern freeawy... those 30% of trips would need to access or egress from the eastern somewhere so that implies growth on most/all interchanges along the eastern alignment. Their was a map in one of the traffic studies that zoomed out and showed this growth but funnily enough the TV adds and Youtube focused in only on roads with reductions... I think Chandler Hwy was a 10-20% increase! Balance Balance Balance - a cop out. a) we are too auto-dependent. b) the tradies, sales people et al are merely a very vocal and whiney minority (last pointed quoted above). d) Splitting / balancing capital across both road and PT expansion would keep the rate of car share mode reduction slow: it needs to speed up. b) Where and in what forum are they vocalizing and whining ? I think it's the 'environmentalists' that are doing most of that. They exist and need to get about our city doing their job for which they need to use vehicles, public transport or bicycles are not an option for them. c) If you built the EWL and Donny Rail and subsequently narrowed the inner city roads and lumped a decent toll on the freeway I'm sure you could quickly encourage those lazy motorists to consider other modes of transport, but the EWL is long long overdue it's as simple as that. A child could connect the missing links on the major arteries that form our road network. d) Car Share ? In theory that only promotes more car use. People that could car share ie. both journey into the city should be encouraged to move to the public transport that also needs to be built (though certainly they should car share to the Park & Rides that would need to be built at the Doncaster Rail stations to make it work in our heavily decentralized suburbs, which in itself is a reason car pooling doesn't work well in our city). The vehicles that remain that need to use the roads & tunnels are not typically headed to the same location as anyone else. Just like you need to accept that building more freeways WILL NOT FIX THE PROBLEM! The well documented science of induced traffic will ensure the only thing that would change with EW Link is rather than sitting in a traffic jam above Alexandra Pde, you'll sit in a traffic jam below Alexdrandra Pde, and you'll pay for the privilege via a toll! The only way to reduce congestion, and the pollution you spoke of, is to take cars off the road, not add more. And the only way you'll reduce demand for cars is to have a viable alternative - ie Better Public Transport - ie Trains, Trams, Buses and Cycle Lanes. Not just 'building a rail line' like you flippantly suggested. Every poll taken where people were asked to choose between funding for PT or EW Link, not just support for EW Link in isolation, showed majority support for PT. By a long way. If Victorians, on the whole, believed that the East-West Link project was important, but not important enough to change their vote for, what does that suggest to you, Adrian? To me, it suggests that on balance, they feel that they can live without it. And perhaps if Labor manages to significantly improve the PT option in Melbourne, that sentiment will only deepen by the next election. It's not like Education and Health are going away as priorities in state electorates, is it? Now the the PT love-in jamboree has prevailed, can focus now shift to removing level crossings and increasing rail frequency? It suggests to me Bilby that the majority of Victorians do not live the area and would rarely use it, therefore although the majority think it should be built, the majority also don't care either way as it doesn't affect them. I completely agree with the science of induced traffic, build an extra lane and it will be filled, build the tunnel and yes it will still be a traffic jam during peak hour. But if you've ever been stuck in traffic down Alexandra Pde on a weekend for all the day trippers, holiday makers and people just generally getting about you'd understand that traffic does not need to be there, it should be underground. To all the people that say it shouldn't be built now or ever for all time, would you rip out the City Link today given the choice ? The West Gate bridge, the Hume Bypass in Craigieburn and all the other missing links that have to date been completed ? Shall we live in a city without freeways at all ? To me that is the universal opinion I am hearing from everyone here. I don't know whether I would suggest a city without freeways, but we are well and truly backward in regards to international cities when it comes to our rail network - London, New York, Boston, Tokyo ... Melbourne? All have freeways, and yet I know which one I'd have the most trouble moving around in a hurry! Even if you support improving roads this project was a dog. Citylink was constructed at no cost to the taxpayer, except for the initial cost of acquiring the land required for the project, and Transurban took on all the risk associated with the project. The cost-benefit ratio for Citylink was double that of East West link which meant that Transurban would not only make their money back from the tolls but would make substantial profits. But it is nowhere near a commercial proposition without government funding and guarantees and there are many more road projects around Melbourne and Victoria that would be significantly better value for money that East West link such as fixing the backlog of arterial road construction in the outer suburbs and improvements to rural freeways. Good point's as always NH, and I would agree with you we should only build this if it's economically viable. My annoyance is at people who think it should *never* be built and we try to survive purely with Public Transport especially in such a decentralized area as Eastern Melbourne. That is a hippie pipedream that in the real world of Melbourne will never cut it short of banning all vehicles. Once again you need to get trucks etc. off inner city streets, to me such anti freeway opinions just smack of political agenda and nothing more. Bilby - those cities are all far more densely populated than Melbourne where public transport works because the users are typically walking distance not driving distance to the stations and the amount of users warrants far greater frequency which in turn encourages people to use it. So we are 'truly backwards' as a result of our geography and population density but I think we do a much better job than so many similarly decentralized American cities (a much fairer comparison) which rely solely on freeways with next to zero PT and are of course a true traffic hell. Again don't think I'm mindful that we need to improve BOTH, but we also need BOTH. One example to improve PT - we should split our 3x3 train carriages into 1x3 carriages and triple the frequency all day except during off peak hours. At mid afternoon trying to get from suburb to inner city you have to wait 30-40 mins for a 3x3 train which is ridiculous and discouraging. If the Doncaster Rail ever get's built it will need to have very efficient easy access park & rides, I picture something like a spiral carpark with a fast congestion free entry/exit system with upgraded road connections at the Chandler & Burke Rd exits - where the stations would not be within walking distance of any user. It should also be a *fast* train so people actually want to use it because it's a lot faster and easier to use, rather than staying in the comfort of their vehicles. I'm sick of the 'tradies can't use public transport' argument that is constantly thrown up in defence of the EW Link and against public transport. Obviously (in many/most cases) it is not practical for tradies to use public transport. There is however many people in cars on the roads now that could be on public transport (if a viable alternative with good service is offered). Get those people onto public transport and off the roads by building/providing for a quality public transport system. Free the space these people are using and leave the roads for people who have no alternative. Agreed FedSquared but the simple fact is forget the Eastern Corridor for a moment, Public Transport is too expensive to encourage even more road users to use it. I could catch a train to work tomorrow but it costs me roughly the same as using my car (yes factoring in running costs etc.) so why would I give up the comfort and door-to-door access for a noisy stuffy train that only drops me 1km from work. PT should be half the price it is now with twice the frequency and the traffic problems on all our major city bound arterials would be halved overnight, like to see the Labor Government trial this. Public Transport is too expensive to encourage even more road users to use it. Adrian - You must be joking! Have a look at Alastair's comment from earlier - cost does not make the top 5 reasons people dont use PT! Cost is rarely a driver for patronage levels - people are happy to pay as long as they get value for money. Saying its cheaper to drive than catch a train is a ludicrous claim. Have a look at the RAA's list of running costs for all size cars per week. The cheapest is the Suzuki Alto (a micro car) at $113 a week. The most expensive is about $250 a week. A 28 day myki pass is $123.20 or $30.80 a week!!!! So you're saying you agree that EW Link would be a car park at peak hour, but we should still spend $6.8 billion to make it a bit faster for weekend day trippers??? The whole justification for building it is that peak hour congestion costs the economy billions in lost productivity. The CBR would be zero if you just build it for holiday makers - where's the economic benefit for that?? The reality is all these arguments are just a cop out. You dont HAVE to drive, you just don't want to get out of your car. Its a common problem - Melbournians have been conditioned to believe that driving their car to work is their god given right - regardless of their actual need to do so. Fedsquared nailed it earlier when he said that these people are just screwing it up for the people who actually do need to drive - ie tradies etc. Its the mentality that needs to change. Unfortunately, our esteemed PM, Tony 'Roads are a sign of progress' Abbott is not helping. I read a great quote recently on UM's twitter feed (forgot who said it) - 'A great city is not one where poor people are forced to catch PT, its one where rich people choose to'. Most other cities in the world have woken up to this and are falling over themselves to upgrade PT. We are one of the few (if only) countries still building urban freeways. We are the laughing stock of the developed world! I'm sorry Martin but your logic is flawed. In many cases where people are driving to work, they would own a car for weekend use anyway. In this case running costs such as insurance, repairs etc are indirect costs which should not be wholly included in weekday commute costs. Secondly, in the case where two or more people are commuting to work via car, it almost always stacks up to drive rather than catch PT. In regards to the reasons given for not using public transport, most of these issues relate to the lack of perceived value for money. If for example PT was free, no doubt the public would be a little more forgiving for a lack of services/condition of vehicles. But at this point to pay minimum ~$7 a day for crowded, unreliable services does not stack up from a value point of view. Therefore PT may in some cases be cheaper, but it is not better value. Unfortunately inner Melbourne has very very little PT in the east west direction. Trains and trams run in a radial pattern in and out of the city. For example, to get from Abbotsford to Flemington via PT, the PT Vic website indicates that the quickest way to make this journey requires two separate trams and a bus, with a total travel time of 45 minutes. Another option is to catch two separate trams with a total travel time of 53 minutes. This is an excessive amount of time and effort to travel ~6-7km. I don't think it's fair to accuse the people of Melbourne of being entitled when these are the services on offer. Adrian's comments re: traffic on Alexandra Parade are not isolated to day trippers. I have witnessed this bottleneck on many a weekday morning crossing over Alexandra Parade via the Hurstbridge Line. I don't think the traffic issues on Alexandra are in dispute here. For those who object to the EW link, the question is - can they be alleviated by investment in PT? In my opinion, no. Any additional PT service in this direction would have to contend with a major arterial (Hoddle St), a university, and a zoo. A bus service would be the only realistic option. In my opinion a tunnel under this area, linking two major freeways, and bypassing a significant amount of inner-city traffic, is an ideal solution for both car and bus commuters alike. I think Thistle has just made my point far better than I did. I would own a car anyway, so the annual costs of rego, insurance etc. don't change. Servicing would be more regular but my Hyundai only needs it every 15,000kms so thats about $300 a year extra than if I didn't drive my car to work or $1 a day. In other words it basically comes down to fuel vs. ticket in which case let me re-state the above again - I pay about $8 per day in fuel & servicing right now vs. $9.50 per day for Zone 1+2 monthly pass (ie. 20 days worth and that's if I bought the monthly pass which I don't as I don't always work in the office yet Myki 28 pass is nastily consecutive not conveniently perpetual). If I was Zone 1 my fuel would be cheaper as would the pass so it's still on par. So I am one who currently doesn't see the value in the daily commute - how many others are there out there like me ? Not saying the other reasons in Alastair's list aren't equally valid and indeed maybe most Victorian's aren't concerned about the cost. Those reasons all need to be addressed as well. Frequency is a shocker of an issue. How many times have I caught a 9pm train home from Flemington which only comes ever 30 mins but has 3x3 carriages that are empty !! Why not split them for 1x3 service every 10 mins ? Now - on the other hand I am actually coming around to the opinion that the current EWL *is* too expensive for what benefits it will bring, but I will stand 100% by the fact it *does* need to be built, as Thistle again illustrated better than I. A change of thinking? Not a chance. Roads are still king, and that won't change under Labor either. The Metro Rail Tunnel of any form is now a distant memory really given that they have allocated next to everything on other promises, with a more aggressive rail crossing removal program and the Mernda rail extension just about the only things on the agenda of any note. If they were really serious, they would commit to the Metro Rail Tunnel now in its place. It hasn't even given a commitment to build it, just indicated it didn't like the coalitions plan. Dandrews says he's got 'lots of other things he want's to build' with the $3b funding etc. so what exactly does he want to build ? The East-West Link is dead. Long live the East-West Link! I don't know what all this talk is about the East-West Link being dead. It has just shifted down the priority list. Ultimately it will need to be built it simply isn't justified for the foreseeable future until we improve the public transport system. The priority has now been mandated to resolve the issue of moving people en-mass around the city in an efficient manner. Once we get this part right then we can look at how other modes of transport can be improved. I run a business that requires me to get around town a fair bit and although the EW Link would have been very handy, I don't find it particularly problematic in getting around the inner north/west and it won't be a real problem for many years to come. But the project can't be called dead....just postponed. But I have always wondered...with this terrific AAA+ state financial rating we have, couldn't we borrow the money and have both the EW Link and the Melbourne metro built at the same time. Now there's your infrastructure led recovery if you every had it. Would make the infrastructure Prime Minister happy! The logic of your argument blows my mind Peter. How the hell is not connecting a major transport LINK smart 21st century planning!? Melbourne continues to grow at 100,000 per year and we desperately need to LINK our road infrastructure (including Northern Link), just as we need to free up our rail capacity via Melbourne Rail. Furture Melbourne needs BOTH to happen - championing one over the other is mere small-mindedness. Melbourne Muse, I believe the answer lies in the term, '21st century planning'. Have a look around the world - how many cities are moving ahead with freeways as solutions to transport issues? How many urbanists and urban planners believe freeways represent best practice in solving urban transport issues today? If you can answer those questions, then you have your answer. Bilby, I believe the key word you're overlooking is LINK. By the way, there are many cities around the world who still see new roads as an important part of their overall transport strategies. Those who don't are extremely likely to already have the linkages and ring-roads they require already in place - we do not. This is why we desperately need EW Link and the Northern Link, just as Melbourne 2030 also needs Melbourne Rail and RR Link to improve and expand capacity on our rail network. Melbourne is a very large, car-based city, particularly beyond it's core. To demand that these missing road linkages are not needed simply lacks logic. I for one am glad the East West toll road is not being built, however besides the archaic level crossings the problem for me with Melbourne's public transport network is the lack of connectivity .. It's so annoying to always have to travel in to go back out. Somewhat confusing Paul. You bemoan the lack of 'connectivity' in our network yet don't approve of EW Link?? This is/was one of the major missing linkage 'connections' in our (currently ineffective) road network. Peter Newman is just another example of a political activist with an agenda, put him on a stretching rack and he will never concede freeways are a good idea or are needed. They have one opinion for whatever reason and will never bend on it. Zero respect. I've learned quite a bit from the opinions put forward on here and SSC and I've changed my tune to agree the EWL is not worth building at the cost & manner the Libs proposed and for the amount of usage it will actually get by vehicles that need to use it (trucks, tradies etc.). I also pay credence to the 'Vancouver solution' of a city without freeways, the 'build it and it will fill' or induced traffic issue, and I agree we completely need to cut down on our car use. I would love to live in a traffic & car free Melbourne (anyone who wants to come out for a beer and hear my idea about personal transport pods give me a buzz). But reality is we cannot tear up our Freeways and start from scratch, we have them and we have cars and all the ideology in the world isn't going to change it, so we have to accept it and do something about it. Our freeways need to be connected just as we much need to dramatically improve our other means of transport to actually encourage people not to use cars. People who think shoving all that traffic through the inner city streets past Melb Uni, the Cemetary, the Zoo etc. is the solution and that the EWL, the Ring-Road connector & N-S Link etc. should *never ever* be built even if it was free just prove themselves to be noisy activists (just like the Michael Buxton's who think all tall towers are evil) with no acceptance of the actual Melbourne we live in. Melbourne Muse, the roads are already 'linked', it's just that there is too much traffic on them in peak times to make travel effective on them at those times. Would EW solve the traffic problem, in your view? If so, for how long, given Melbourne's growing population? And what evidence would support your claims? Bilby, now you're little more than doing yourself a disservice my friend. Please explain how the Eastern Freeway is 'linked' to anything? How the hell do you get to the Airport, Melbourne's West, Geelong etc. from there? EW Link is a crucial connection - one of a few missing linkages which would make Melbourne's entire road network function more effectlively - most obviously by taking millions of trips p/a AWAY from the Monash and through Central Melbourne. Beijing (where I travel every few years) with it's 6 connected Ring Roads has a fully evolved and linked road system - Melbourne does not. As stated, EW Link is only part of what Melbourne needs, yet it, and the missing Northern Link, remains almost as crucial as increasing capacity on Melbourne's rail network. It's as obvoius as the nose on your face. 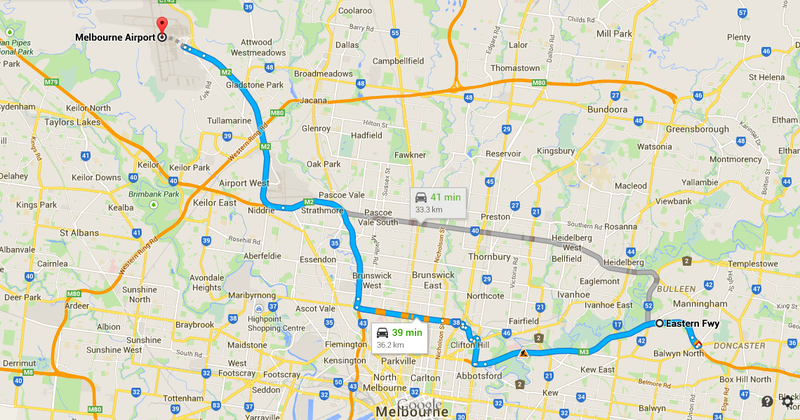 Here's how you get to the airport from the Eastern freeway, according to Google, anyway. The roads definitely link up. The traffic is bad, however - as I said above. So we need to do something about that - the EW link won't fix that particular problem ... will it? If so, how? That rabbit trail is EXACTLY why we need EW Link. You illustrate my point well. I am not against an EW link however it is a question of priorities. The main issue with the EW link is the reoccuring issue of putting PT last while very expensive road projects are planned for and delivered ASAP. MM1, tram extensions and bus reforms will move significantly more people than the EW link and it will affect the entire metro area rather than the inner North. In regards to road projects the NE link should have a higher priority than the EW link because it will shift freight and road traffic around the metro area rather than through it. To everyone who thinks the Eastern doesn't get that much industrial traffic, come for a peak hour drive next industrial RDO day and see how much lighter the traffic is, whatever the statistics say. All the people that are pushing the 'PT first' argument don't appear to actually be supporting the Doncaster Rail, just other PT projects like the Metro Rail link ie. the greater population of Melbourne. The people of the Eastern suburbs deserve some sort of solution to the years and years they've put up with no direct Airport or West connections, whether that's rail or EWL or NE link or whatever. The East Link has of course only made matters worse with all the extra traffic creating completely avoidable non-peak daily jams at Doncaster Rd & Bulleen Rd exits as well as good old Alexandra Pde. Sadly now that Labor's back in charge the blue ribbon strip probably won't see any money spent until the next change of power. so if Eastlink made it worse by connecting a 3 lane tollway at one end of the Eastern how do you think the Eastern Freeway would have coped with 3 new lanes of East West Link tunnel being jammed in at the city end in addition to the existing Hoddle Street and Alexandra Parade (i.e. Lygon/Rathdowne/Nicholson/Brunswick/Smith) traffic??? The Eastern gets nowhere the industrial traffic that Citylink does even if it does, rail can also move freight it doesn't always have to be on trucks. Tram extensions, bus reforms and Railway quadding on the Ringwood corridor can easily help solve the mobility issues in these areas. MM1 may not directly link up with the so called blue ribbon areas although it will increase capacity on the entire network. MM2 combined with the Doncaster Rail will allow an alternative to using private transportation along the whole northern and eastern corridor. It just takes vision and a belief that each traffic problem does not need an expensive new road. Well it seems I was right ..
Mr Andrews said his government’s priority was building infrastructure that “Victorians so clearly voted for” — and that did not include the eastern section of the East West Link. Umm yeah that's why every single seat along the Eastern Fwy corridor that would benefit went to the Liberals. Tram extensions, bus reforms and Railway quadding on the Ringwood corridor can easily help solve the mobility issues in these areas. Except that no tram or railway actually *exists* along the Eastern Fwy corridor yet. Buses are not a solution we want. It's one of Melbourne's assets that the city has relative few noisy polluting bus sewers thanks to our trams, unlike say George St Sydney which is a bus lane hell. Buses are not a solution we want. although the Doncaster Area buses do carry a hell of a lot of people into the CBD... it is well used and the Doncaster rail study estimated that a train line wouldn't carry a great deal more people. There isn't anything wrong with the buses the problem is that they get stuck in private vehicle traffic on Hoddle Street... should be permanent bus lanes. At risk of sounding like a broken record. We do not .. I repeat .. we do *NOT* want more buses in Melbourne CBD - it's what makes our CBD a wonderful place to be the fact we have relatively few. Do we want our CBD to become like George St, Sydney ?? Have you seen what it does to the urban fabric of the CBD, the pedestrian friendliness of the screetscape ? Imagine if every tram route was replaced by noisy diesel polluting buses. Even if they were electric the very nature of buses ruins any streetscape they are on. If Doncaster Rail is too expensive then surely Doncaster LIGHT Rail would be the next most cost effective alternative. Fast trams running up the Eastern Fwy picking people up from the Park & Rides where local buses can then ferry people around the neighborhoods to which they are more suited for the variety of routes they can provide. Buses should NOT be allowed in or near any major city - period. The only bus sewer in Melbourne CBD right now is Queen/Lonsdale St which carries all the Eastern Fwy bus traffic. It's BAD enough as it is we do NOT want it any worse. Anyone that promotes buses ahead of Train or Tram alternatives clearly has no interest in retaining Melbourne's wonderful pedestrian friendliness in and around inner city. Even if the Doncaster (Light) Rail only carried the same amount of traffic but meant getting rid of all those buses from infesting the CBD it would STILL be worth the money in my opinion. Liberal retained all of the seats along the Eastern Freeway corridor because they are all safe blue ribbon liberal seats but there were swings against the liberals in all of these seats including 4.4% in Bulleen, 5% in Kew and 5% in Warrandyte. Hardly a ringing endorsement of E-W link if the seats that were supposed to benefit the most had big swings against the Liberals. I guess my point is that given the expense to build these Eastern transport projects vs. % of population of Melbourne that will use & benefit from them combined with no urban growth boundaries in that direction, these projects will probably never will get built. hasn't this elicited comment... no doubt everyone who has commented is significantly less qualified to comment than Mr Newman himself. who for many years before being on the IA advisory board was a prominent transport professional and researcher in WA. Thistle notes that it takes 45 minutes to get from Abbotsford to Flemington by public transport... he then concludes that therefore the way to fix this is to build a $6-8 billion road tunnel to allow people to make that trip faster by car. Nonsensical. Maybe a cheap and cheerful alternative would be to run regular bus services from say Clifton Hill along Alexandra/Princes/McCarthur/Racecourse to Flemington Bridge and Newmarket Stations, and to push some of the 200 buses further west along Grattan Street and maybe Arden Street to North Melbourne Station, to run a bus (or tram the full length of Victoria Street). And if the problem is the ACTUAL existing surface traffic (not a perceived need for traffic that might use the tunnel post opening) and that given so much of the existing traffic on Alexandra is heading to the inner north and the city (not to the west) maybe a longer term better solution is to build that rail tunnel from Clifton Hill via Fitzroy and Parkville to Flagstaff (the places people are really trying to go to) that was proposed in the Doncaster rail assessment and not a road tunnel to create a whole different set of car based trips. Adrian's comments re: traffic on Alexandra Parade are not isolated to day trippers. I have witnessed this bottleneck on many a weekday morning crossing over Alexandra Parade via the Hurstbridge Line. I don't think the traffic issues on Alexandra are in dispute here. For those who object to the EW link, the question is - can they be alleviated by investment in PT? In my opinion, no. Maybe you should have read the rest of my post? I also suggested that additional bus services in the EW direction would be ideal. However where are these buses supposed to go? Onto already crowded streets through the inner north? Buses are the WORST offenders when it comes to traffic congestion. Why not have a dedicated bus lane as part of the EW tunnel? Assuming a 30% growth in Eastern Freeway traffic that would imply similar arterial traffic growth along all the roads along the corridor. These roads would include but are not limited to Doncaster Rd, Blackburn Rd, Elgar Rd, Springvale Rd and Blackburn Rds. All these roads carry significant local and city bound bus traffic. I would expect that many of these buses would be delayed by congestion on the suburban end as well as the city end. Fundamentally as in all major road projects, the key problem is not only induced traffic but also their propensity to alleviate traffic in one section and exacerbate it downstream or onto other connecting roads that haven't been widened to deal with the extra traffic. This is why planners and transport academics prefer PT investment over roads or at least a balance of funding. PT users get taken out of the road system completely (as in the case of rail) or in the case of buses use much less road space than private vehicles. Cars with on passenger are the worst offenders when it comes to congestion, the problem with Melbourne is that bus service is poor and infrequent. Even though freeways can alleviate parallel traffic on arterial roads they cause far more problems for two key reasons listed below. - Diverting funding away from PT improvements. - Competing with buses by making it more convenient and quicker to travel by car than bus or other rail (even if buses use some of the freeway it does not make up for the much greater convenience of private cars). - Connecting arterial roads will have far more traffic (Ie Hoddle St and Chandler Hwy), which is the main route that DART uses to go into the CBD not Alexandra Parade which has few bus services. - With freeways all over the city and no reasonable competing PT services you only entrench car dependency. I don't see how building a large tunnel designed for cars is going to help buses or other PT. 1. The current backlash definitely proves that people never accepted economic reason as a basis for making decisions. This in itself is rational as what people are doing is trying to use economic reason to influence their own decisions within their control, but trying to trash government processes to socialise the obvious losses from building EWL to others. Definitely a rational thing to do. 2. It shows the limits to 'democracy' and suggests 'democracy' might have a limited life. One thing that I've noticed is that 'future voters' including those people who don't yet live in Melbourne because they are not born, nor immigrated yet, don't get a say in decisions that clearly will impact them. 3. It is funny that people complain about irrational government approaches to climate change, if only because this is normal in transport policy. Talk any transport topic, you will be talking to people who have drunk plenty of Kool-Aid even in government. 4. George Mega is wrong too - though I respect him for asking the right questions - I don't think the public have ever bought 'reform' and while they acknowledge Hawke and Keating delivered us modern Australia - they never accepted the means and only want the fruits of the end. So government either need sufficient political capital to deliver 'reform' that liberates the economy - or we will need to stop asking the public what they think. 5. But the danger of ending democracy is none of the political actors currently on the scene can be trusted with the job. It is a shame someone like Ken Henry - the Wombat Keeper in Chief - was not given a temporary brief by Rudd to suspend the legal system and run the country directly as he seemed to have the right attitude and right skills. Riccardo, your comments are somewhat mystifying. 1. Is it not the case that Labor campaigned against the East-West Link on the basis of its the poor return in the dollar relative to public expenditure? The Greens and others campaigned on broader platforms against it, but they weren't elected to government. Therefore, it's not unreasonable to assume that voters in part accepted this economic reasoning in order to divest themselves of the inordinate costs of building the project compared with the costs of paying compensation. 2. Future voters are a conceptual consideration in a democracy, but, like children, they have no right to vote. Unlike children, however, they don't actually exist, either, so I'm not entirely sure what point you are making here about the 'limits' to democracy. We don't give a voice to every participant in democracy now, presumably because not all participants are capable of taking on the responsibility of voting. So how can can we give democratic voice to those who don't exist? Furthermore, the decisions made now, if they can be said to impact these currently non-existent future citizens, can arguably only do so in a positive way, assuming that they ultimately live lives that are worthwhile overall, since they would not otherwise have existed. This is also known as Derek Parfit's 'Non-Identity Principle'. So, this is not strictly speaking a weakness of democracy. 3. I'm not clear on what you meant here. 4. This seems to be an issue of good / clever political leadership rather than a problem with democratic principles per se. Fortunately, Machiavelli is not incompatible with any particular form of government, including democratic ones, so effective politicians need not build political capital in every arena of civic life in order to master necessary reforms of the state. 5. Democracies are rarely 'ended' but rather killed off, so the 'danger' you describe is very real, but ironically, for the reverse reasons of what you have suggested. Those who cannot be trusted to do a 'good job' in terms of representing people's interests are all too often the same ones who deem themselves justified in taking power by whatever means they can - including by trashing democracy and its ideals. The progress of Weimar Republic in 1920s and '30s Germany makes for an edifying historical account on this score. No Bilby my comments are not mystifying, they are clearly and logically presented and consistent with my other views. I was not referring to the election result, but the backlash against Andrews decision. Even if this backlash comes from the 'losing' position, it is still both worrying and wrong. People who ostensibly supported the conservative side of politics they behave irrationally and reject economics, which has been laid out clearly. Even if it is a minority position, that it exists at all and is given any credence suggests democracy has its limits. I'm not interested in your philosophising over non existent people. You cannot ask four million people how to build a city for eight million, and expect them to place any weight on e interests of those who are coming but not yet here. They will only think for themselves. Another limit of so called democracy. Well, I did say, 'somewhat' mystifying, Riccardo.